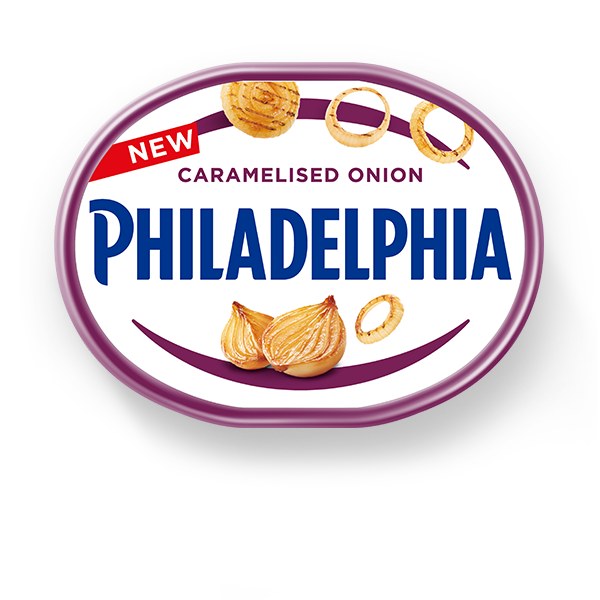 Made with milk and real cream, Philadelphia Caramelised Onion has the same fresh and creamy taste as Original but with 40% less fat and packed with delicious Caramelised Onion. Stir into sliced chicken pieces with chopped mushrooms for a quick Stroganoff, or create a deliciously creamy sauce that goes perfectly with pork chops and a side of new potatoes. Philadelphia is fantastically versatile, whether you are looking for a delicious lunch or a more inspiring dinner. See our recipes for more delicious inspiration. Made with pasteurised milk and with no added preservatives. Suitable for Vegetarians. Medium fat soft cheese, caramelised onions 3% (onions, sugar, rapeseed oil), sugar, roasted onions, Aceto Balsamico di Modena PGI 0.7% [wine vinegar, grape must concentrate, colour (E150d)], salt, stabilisers (locust bean gum, carrageenan), onions, spirit vinegar, modified starch, flavouring, acid (citric acid).